The Agents of S.H.I.E.L.D. are getting a very special guest star this week, but why is she working for Hydra? Plus, comic book anti-hero Constantine comes to TV for some mystical hijinks and Grimm and The 100 both return. Check out the latest clips and details below! Syfy's running a Halloween-themed movie marathon today, starting with Birth and 12:30 PM, and ending with Hellboy at 11:30 PM. Hmm, so this week, the city is dealing with a drug that causes people to experience euphoria before dying. So they die with a smile on their face? Meanwhile, Cobblepot is working his way into Maroni's inner circle while Fish Mooney continues her plot against Falcone. When Klaus (Joseph Morgan) and Elijah (Daniel Gillies) receive a cryptic invitation to dinner from their mother Esther, who continues to inhabit the body of Harvest girl Cassie (guest star Natalie Dreyfuss), they find themselves preparing for the worst. With the help of a new witch named Lenore (guest star Sonja Sohn), Klaus, Elijah and Hayley (Phoebe Tonkin) attempt to stay one step ahead of Esther, but things quickly take an unexpected turn. While Elijah finds himself reluctantly teaming up with Gia (guest star Nishi Munshi), a newly-turned vampire, Hayley is faced with an enticing proposition about her new status as a Hybrid after a startling encounter with Esther. Finally, Esther reveals a shocking secret about Klaus' childhood and unveils her ultimate plan for her children. The week in tech gibberish, the super-genius team has to prevent a nuclear reactor from melting down. As if Ichabod didn't have enough issues with people from his past, a woman he knew long ago comes to Sleepy Hollow as an undead Weeping Lady, and as the name implies, she ain't happy. Plus, Katrina and Ichabod learn some things about each other's pasts that don't make them happy, either. Ezra and Zeb end up on a simple mission that proves not so simple when they steal an Imperial vehicle. Starman's antagonist the Mist (the Kyle Nimbus version) shows up this week to take vengeance on Joe—just as Joe decides to finally decides to visit Henry in prison. And the S.T.A.R. Labs team remember the night that the particle accelerator appeared to kill Caitlin's fiancé Ronnie. That would be Ronnie Raymond, a.k.a. Firestorm. It's Mockingbird time! Adrianne Palicki guest stars as Hydra security chief Bobbi Morse. Could the Agents of S.H.I.E.L.D. eventually make her one of the good guys? Meanwhile, Skye's papa Kyle MacLachlan "forces Raina to reunite him with his daughter at any cost." Even Crowley is thoroughly sick of demon Dean at this point. 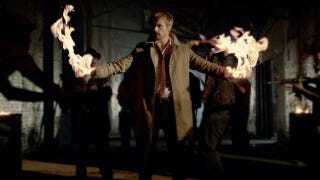 With Dean causing him all sorts of problems in Hell, Crowley decides to team up with Castiel. Giving someone your heart is sweet, but sending homicide someone else's heart is goddamn insane. Someone is copying the crimes of Jack the Ripper and the Black Dahlia murder. Of course Henry investigated both of them at different points in his life, because like all immortals, Henry is a famous murder magnet. Jason Ritter guest stars as a political pollster whose number comes up just as his usually ironclad predictions are proven wrong. Suspicious Finch is suspicious. Oliver and Felicity track down Thea, and Oliver decides to head to Corto Maltese to retrieve her. We'll see what Thea has to say about that. Diggle and Roy go with him. Roy feels responsible for Thea's departure, but Diggle is looking for one of Lyla's operatives who has gone dark. The new season picks up where the last one left off, with Clarke in that white room and the fates of Bellamy, Finn, and Raven are unclear. But what about the survivors of the Ark? They have to face a new set of dilemmas now that they're on Earth. Because of an old carny superstition, the freak show performers refuse to work on Halloween, and Jimmy finds himself taken with a woman who claims to be a fortuneteller. Robin, in his infinite wisdom, has decided to ration bathroom time to five minutes at a time. So the other Titans try to team him the joys of luxurious bathroom time. Steven, Lars, and Sadie need to mend their friendship, so Steven takes them on vacation to a magical beach. Damon has to re-live one of the last days of his life to find a key to getting him and Bonnie home. Alaric tries to help the grieving Jeremy get his life back together, and Stefan teaches Elena one of a vampire's most valuable skills: creating a new identity. The Airbender kids go off in search of Korra. But what is Kuvira up to in the meantime? Audrey and Nathan are reunited at last. Okay. But a fresh Trouble could tear them apart forever. Season Four opens with Nick dealing with losing his identity as a Grimm and Trubel facing the consequences of the murder she committed. Presumably Monroe and Rosalee are having an interesting honeymoon. Everyone's favorite Hellblazing antihero comes to television this week. John Constantine has abandoned his campaign against evil, but he's pulled back in again when a friend's daughter becomes a target of supernatural forces. On the fence about watching this one? You can check out our review of the pilot here. Can a gun show in the zombie apocalypse be scarier than the zombies? Our survivors come across some armed chaos this week. The forests have invaded London and every other city in the world. I know the kids are scared, but maybe the Doctor should side with nature on this one? Rumor has it that someone named Lily will be showing up in Storybrooke this episode. She's bad news, and she may be Henry's first crush. Barbara tries to mend her relationship with Fred and Maggie—but Margaret's having none of that. Bellamy tries to keep his secret from Maggie, but it's increasingly difficult as an illness spreads through the returned. What happens then Rick his crew face the Termites? Will Bob utter Dale's line from the comics? And how long will it take the survivors to figure out Gabriel's secret?